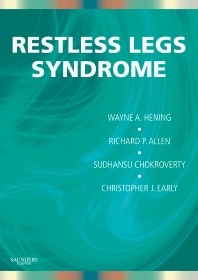 Recognized international leaders in the field of restless legs syndrome bring you their expertise in this clinically-focused, practical resource. Understand the various causes of this common movement and sleep disturbance and identify the best treatment options in each case. The text provides comprehensive overviews of both pharmacologic and non-pharmacologic approaches, covering benefits, limitations, and side-effect profiles. No matter what your specialty, if you treat any patients with restless legs syndrome, this book has everything you need to offer them the best care possible. Features international experts who discuss the most recent findings on symptomatic relief for your patients in a comprehensive section on current drug choices. Covers co-morbidities and special populations so you can properly treat everyone from children to pregnant women to patients with other neurological disorders. Emphasizes clinical material so you can apply the material to those secondary causes of restless legs syndrome such as anemia and rheumatoid arthritis. Surveys the emerging understandings of the biology of the disorder to present you with a comprehensive understanding of restless legs syndrome.